Signature Homestyles is a direct sales company founded in 1971 by Madolyn Johnson, to help women with their decorating needs.Their versatile and functional home decor, organizational solutions and accessories are sold through their network of consultants in US and Canada. Their mission is make a difference one at a time by providing organizing and decorating products in every home. Signature Homestyles have been receiving prestigious awards since 1999 for their commitment and empowerment to Direct Selling. They have been creating amazing products for decorating and organizing for everyday and holiday use. They wish to enhance homes with their useful and creative products. Their products are divided to 3 groups: Organize, Colorize and Accessorize. 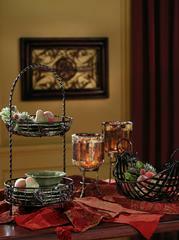 These products range from candleholders, vases, trays, canvass, pillow covers, wall decors, runners and more. And what’s amazing is that you can decorate your home using these products for occasions; Halloween, Thanksgiving, Christmas and more. It’s always nice to come home to a warm welcome of colors and occasion. Check out their products now. Signature Homestyles offer their consultants a number of rewards. As a consultant you get to have your own Classic Signature Homestyles Show Case just what you need to start off, 25-30% commission, earn free vacation trips and free products plus you get flexible time and no inventories.